Vibya is a sweet and energetic 13 year old girl with an unimaginable past. 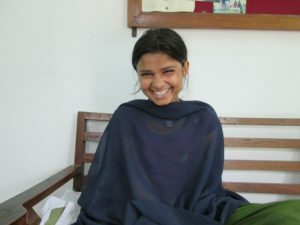 Originally from India’s Assam State, in her early childhood Vibya and her siblings lived with both their parents, but their father, affected by leprosy and tuberculosis, was apparently an unkind man and eventually Vibya’s mother felt she had no choice but to leave him and look after the children alone. She started selling popcorn to try and support her family’s needs and provide schooling for her two remaining sons, but she soon struggled to support her children. Vibya was 10 years old at the time and had been attending school, but her mother decided to stop her education and instead arranged for her to marry a boy just a year older than her. The prospect of her daughter’s marriage was appealing to Vibya’s mother, who was worried for her children as her two elder daughters had already died. The marriage would free her from the financial responsibility of caring for Vibya, while her two sons were left to do whatever they could – even begging – to keep themselves alive. The name Vibya means “light” in Hindi but in reality her life was full of darkness. While telling her story to the staff at Lalgadh, she became very emotional as she recalled her struggle living with her husband’s family. Her mother-in-law totally dominated her and treated her like a slave. She would give Vibya stale rice while she and her family ate freshly cooked rice; she beat, threatened and verbally abused Vibya; and instead of allowing her to sleep on a bed like the rest of the family, Vibya was made to sleep on a mat on the floor. While living with her in-laws, Vibya started losing all feeling in her hands and feet and she began to develop clawed fingers. She noticed that she would get blisters on her legs and was puzzled as to why she hadn’t felt any pain. 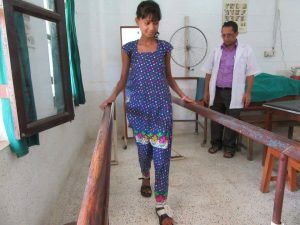 Her young husband and his family gave little attention to her condition or any kind of treatment for Vibya, so as the blisters turned into more serious wounds, she told her mother who brought her to Lalgadh Leprosy Hospital and Services Centre in early 2015 for treatment. 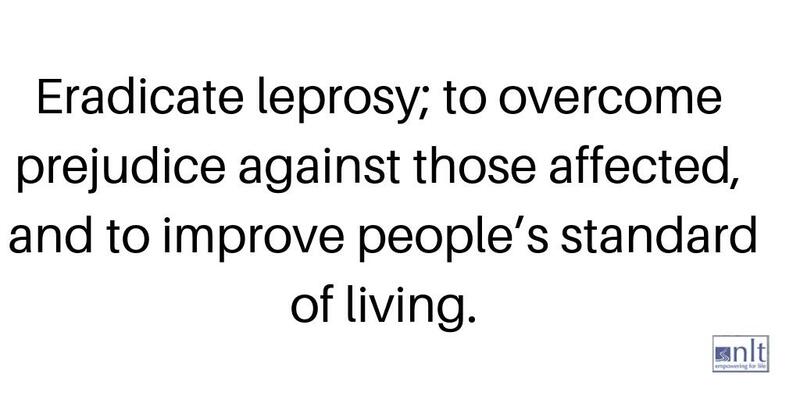 On receiving a diagnosis of leprosy, Vibya’s response was heartbreaking. Vibya has received support from every department of Lalgadh Leprosy Hospital and Services Centre. Since her initial visit to Lalgadh she has been kicked out by her husband’s family, who did not want her anymore when they found out she had leprosy, so she is now back living with her mother and brothers. It has been difficult discovering her story; imagining the beatings, the verbal and psychological abuse, the desperation and the suffering she has been through, but she has chosen to fight back against despair. Thanks to the care and attention she has received at LLHSC, she can now imagine a bright future. 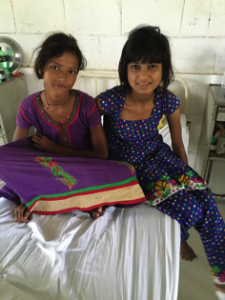 Though she has had to return to Lalgadh for the treatment of an ulcer that developed on her foot, and is still in need of surgery for foot-drop and regular physiotherapy for her damaged hands and feet, Vibya is now much happier and has made friends with other children at the Centre. She has decided she’d like to further her studies and train to be a tailor so that she can support herself, and she is currently learning to read and write at the Centre’s school for inpatients. Please remember Vibya in your thoughts and prayers. Though she has endured unimaginable hardships in her short life, her experience at Lalgadh Leprosy Hospital and Services Centre has turned her life around and she is now growing in confidence and strength, with a hope for a better future ahead of her. If you would like to support Vibya as she continues to move into this new future, you can get in touch with NLT via the Contact Us page.